In March, we highlighted the Build-A-Bride collection of designer Heidi Elnora as a part of our "Designer of the Week" series. On April 24, Elnora brought her Build-A-Bride, newly debuted Hello Darling and couture Heidi Elnora lines to Baton Rouge bridal boutique, I Do Bridal Couture. I Do Bridal Couture has exclusive access in Louisiana to all of Elnora’s designs. The store is also the first to see the Hello Darling line after its New York Bridal Fashion Week debut. LTEC visited with Elnora during the trunk show to discuss her inspirations and her design process. She also talks about her TLC show "Bride by Design" and why she loves what she does for her brides. What was your [inspiration for] Build-A-Bride? Build-A-Bride started in 2008. When I started my company in 2006, brides would always come in and ask for the exact same thing: sweetheart, low scoop back, fit to flare and chapel length train. If I heard it one time, I heard it 1,000. And I thought, ‘why do I keep creating this dress?’ specifically designing it to the bride’s size. So that’s when Build-A–Bride started. I created the Coco Marie, named after my friends, and I would make it in different sizes. I noticed that brides would come in and they would love the Coco Marie, but they would always want all over lace, or a lace bodice or a peplum or sparkle; they would always want to create something special. That’s where I started to develop the different add-on pieces. As the company would grow and more brides would come in, that’s when they would start to ask for different shapes and they’d want different silhouettes – not everyone would want the fit to flare – they wanted more of an a-line shape or a sheath shape. And that is where Build-A–Bride started. And it’s grown from there. TLC approached me after they saw my “One dress 11 ways video” where you could take one dress and wear it 11 ways. Since then, the line has grown and we have 25 add on pieces and different fabric swatches. The three lines definitely differentiate. Build-A–Bride is the all American girl; she wants the ability to create what she wants and she grew up playing with Barbie’s and dress up. Hello Darling is more of your free spirited, my American gypsy. Heidi Elnora is more of a true couture. So when it comes to fabrics each one will have their own identity. Heidi Elnora will have more sparkle and more texture. Hello Darling is more silk crepes, lightweight flowy and chilled out, a little sexier. Build-A–Bride fabrics mix with organza and silk chiffon. Build-A–Bride is where brides have a lot of options between Hello Darling and Heidi Elnora. What is your favorite look in Build-A-Bride? Often times, dresses have so much stuff on them and you think you need all of it to make you look good. You can feel confident in this dress and don’t need all that other stuff. So, I get into a different headspace with every line. With Hello Darling, I got into this Stevie Nicks and Indian princess had a baby idea. It’s just really chill and really cool. As I design Build-A–Bride, I have to get into a totally different headspace because it’s a totally different consumer. When I do Heidi Elnora, which I’m doing right now, I’m already getting into transitioning into this new headspace. 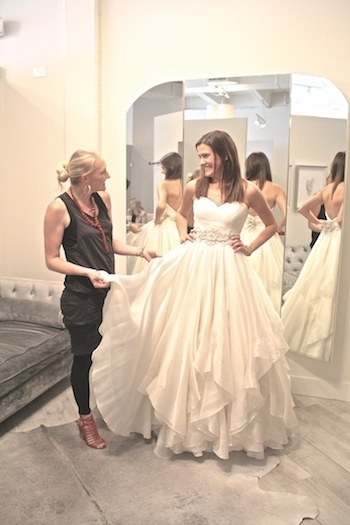 How do you get to know your Heidi Elnora brides? We just sit and talk. It’s the most important part, just sitting and listening to what the bride wants. They just want a voice, they don’t want you to start putting them in dresses just to start, and they want you to really listen. To me, it’s not about ‘oh, I sold a dress today,’ it’s about ‘oh, I made her feel beautiful.’ And that’s really, genuinely how I feel. How I am on the show (“Bride By Design” on TLC) is how I am with all of my brides. I pay attention, I listen and at the end of the day, I just want them to be happy. I genuinely care about each bride. It’s a connection. When asked about the show and a second season, Elnora says they don’t yet know the fate of the show and hope for a second season. It has been a four-year path to get the series started and 10 months of meeting with brides and taping the show. Elnora with your dedicated LTEC correspondent at the I Do Bridal Couture trunk show in Baton Rouge.